Sports Attack, with 40 years of experience in the sports netting industry, offers a line of baseball and softball batting cage nets that are precisely designed and use the highest quality material, including premium knotted netting with superior rope borders. You will find that many of the features found on our products are not available on competitive nets. Nets come hung on the square as opposed to diamond hung as shown at right. Square hung netting hangs much more accurately, making it less prone to wear and easier to repair. It also provides better ball containment around the bottom perimeter. Sports Attack nets have an entry/exit walk-in flap that completely contains balls while allowing safe entry. 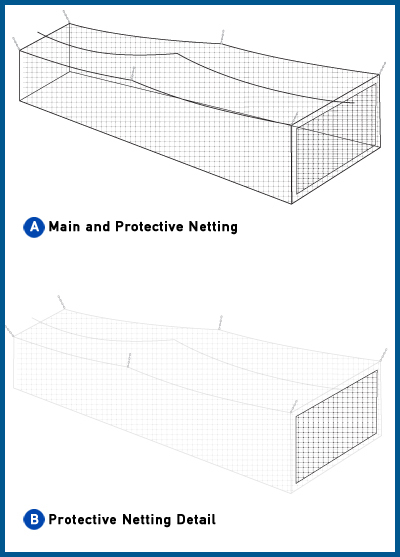 Additionally, our nets have attachment loops every four feet along the sides of the top perimeter, providing easier installation and longer net life. Our clip-on replaceable net panel is designed to protect the high wear area directly behind the hitter. This panel is also used to divide the cage into separate sections for a variety of hitting drills. The unique clip-on method makes the panel extremely versatile, as well as simple and quick to move or replace. Is black in color to provide better vision. It can also be ordered with white tops (no extra charge) if net is going to be used inside in darker areas. 2. Nylon – recommended for indoor use only, heavy-use environments like commercial cages or professional settings. 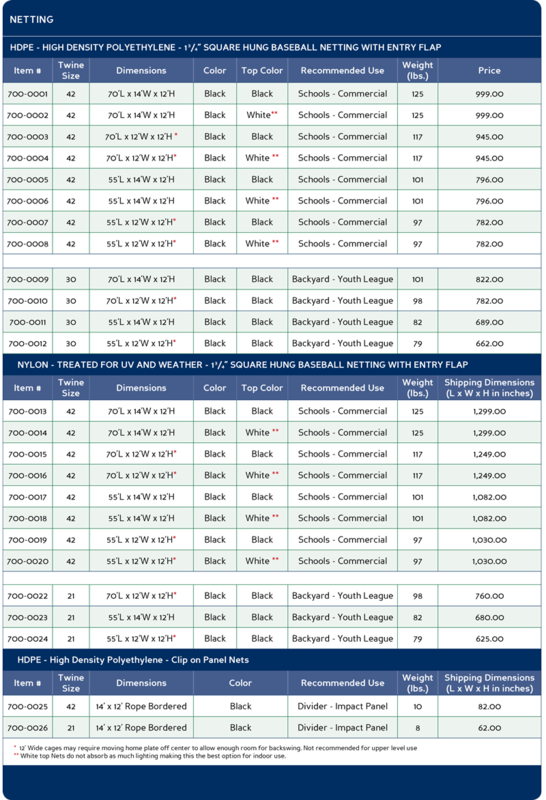 Used in most Major League Baseball and NCAA indoor facilities and stadiums, as well as some high schools. Nylon tends to absorb water, potentially causing rot, shrinkage, discoloration and decrease in breaking strength. Our nets come in twine sizes based on American Standard Sizing. This sizing is based on the number of actual threads woven into the various sizes. The larger the number, the thicker the twine and the stronger the net. For example, #21 has 21 threads and #42 has 42 threads, a much thicker twine and stronger net. Some net retailers use their own unique numbering system that will utilize larger numbers, implying heavier netting. When looking for quality netting, always check carefully by comparing shipping weight. – Designed for light use in backyard, youth and some high school settings. – Perfect for schools at all levels, heavy enough to withstand commercial use. – Intended for heavy team use in professional and commercial batting cages. Maximum durability and life span, typically 7 to 9 years depending on use. All of our nets are knotted which makes them much easier to repair and limits the harm done by broken twine. Breaks or tears in knotless netting will run, causing extensive damage to the net. We carry both 70 ft. and 55 ft. stock netting in both nylon and HDPE for easy ordering. 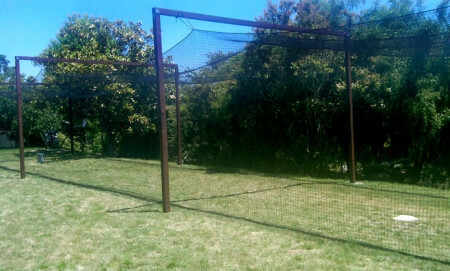 Sports Attack will quote your custom batting cage net, call us today at 1-800-717-4251.